Scotland�s leading regeneration specialist The Burrell Company has appointed two new property experts to join their already thriving team based in the capital. 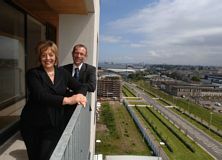 Linda Neill from Edinburgh and Alasdair Tweedie from Stirling, have been enjoying their new role as Sales Manager and Property Manager, respectively, at the award-winning property development company, since joining earlier this year. Linda's previous roles include: Sales Executive at Barratt East Scotland, Senior Design Manager at Taylor Woodrow/Bryant Homes and most recently, Sales Manager with Strathclyde Homes, Central Scotland. Linda's impressive work portfolio, matched with her management, people skills and appetite for a challenge, makes her new role at The Burrell Company a perfect fit. Linda said: "I was searching for a new challenge for a long time and I jumped at the chance when I found out there was a Sales Manager role at The Burrell Company. "The company has a vast range of property developments, from former churches and hospital conversions through to regenerating forgotten urban areas into exciting residential communities. My day is full of variety and involves witnessing wonderful buildings being brought to life." Linda's main responsibilities in her new role includes: liaising closely with selling agents across 20 current property developments; management of site sales operations; ensuring achievement of sales and customer service targets are met; pro-actively maximising brand exposure and delivering the company's sales and marketing strategies on the ground. The Burrell Company's new Project Manager, Alasdair, has already been involved in some of the most high profile developments in the company's history. These include the regeneration of Edinburgh's Waterfront with The Madelvic, and the ambitious re-development of Hawkhead Hospital in Paisley, in a joint planning effort with Kier Homes. Alasdair, a Chartered Surveyor, has over 10 years experience in property development and construction, and will project manage a number of The Burrell Company's developments. He'll be responsible for managing these developments from inception through to completion, utilising his development and project management expertise. His breadth of experience working within the Construction and Development sectors of the industry has included positions with Hart Builders Ltd, Edinburgh; Eildon Housing Association Ltd, Melrose; The EDI Group Ltd, Edinburgh and The Ogilvie Group Ltd, Stirling. Alasdair said: "I've retained a keen interest in The Burrell Company's developments admiring their innovative and contemporary approach to urban regeneration. I look forward to contributing to, and being part of, the ongoing success of this respected company." Andrew Burrell, Managing Director of The Burrell Company said: "We are delighted to welcome Linda and Alasdair on board, they have already become an integral and important part of The Burrell Company's team. They both have a wealth of experience in the industry and I'm confident they'll be an asset to our dedicated team."